Wild Hare Manufacturing Inc. offers a very convenient attachment for our ATV front-end loader: a Pallet Fork. This fork is fantastic for more than just moving pallets. Whether you’ve got a bales of hay, boxes, crates, logs, feed or anything else needs to be moved, attaching forks to your Groundhog will allow for easy lifting, lowering and control. Our fork attachment will save man-hours and increase productivity. You don’t need to spend a fortune on a tractor to see these benefits, when a fork fits right on your ATV. Our forklift attachment not only makes transporting supplies or merchandise easier; its installation is a breeze. This front-end loader attachment allows you to get the most out of your Wild Hare loader. With lifting capacity powered by one set of rocker switches and powerful hydraulics, a 300-pound haul becomes easy and quick. Our products turn a two-man, strenuous job into a one-man, simple task. Attach the forklift to your ATV front loader and save time and labor. It just makes sense! Whether you call it a pallet fork, hay pallet, forklift or a hay carrier, this implement can do it all; so we assume our customers will give it many names. With Wild Hare Manufacturing on your side, you can count on the strength and longevity of your lift—and any other product we sell. Turn a hard day of work into a half-day. 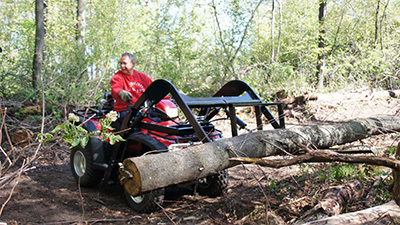 That’s easily manageable with the help of our fork attachment for your ATV front-end loader. Lift more, do more, finish faster. Who doesn’t want that? Transforming your quad into a forklift isn’t something you see every day…at least not with other implement systems on the market. There’s almost nothing your four wheeler can’t do now! Equip your quad with function, quality and greater capacity, equip it with the rugged attachments you can purchase through Wild Hare Manufacturing. All of our products are backed with a year warranty and the pallet fork is no different. 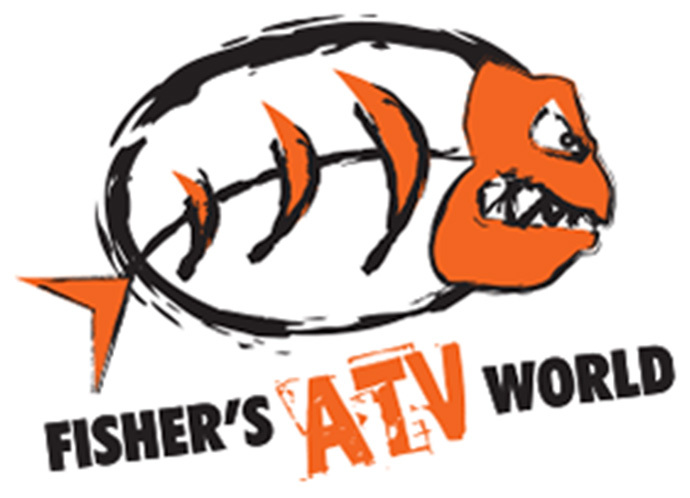 Be confident in your purchase, the company that stands behind it and its performance, choose our quality ATV accessories and you’ll be back – for good reason. Quads are evolving, don’t get left behind. If you have any further questions about The Wild Hare fork attachment we are only a call or email away. Customer service is an important aspect in customer satisfaction and we are dedicated to the contentment of anyone and everyone that purchases the Groundhog, its attachments and any other accessories we provide for your ATV. Contact Wild Hare Manufacturing by phone at 218-483-1000 or email us at info@wildharemfg.com.